Danish Cartoons -- Islam Vs. Freedom Of Expression? Cartoons are doing what so many could not: Unifying Muslims across the globe. On the other hand, a growing number of brave freedom-fighters, led by journalists, are standing up to “reaffirm the principle of free expression.” And non-Muslims are wondering why this unified outrage is a no-show when it comes to seemingly more important issues such as beheadings, honour killings, and suicide bombings. As a Muslim journalist, that puts me in a tough spot, doesn’t it? Let’s get the facts straight. What exactly is the issue? The Danish paper Jyllands-Posten printed a total of 12 cartoons of the Prophet Mohammad(P) last September, one showing him wearing a headdress shaped like a bomb with the kalimah inscribed on it, while another had him saying that paradise is running short of virgins for suicide bombers. A Norwegian publication reprinted the caricatures in January and publications in at least four other countries jumped on the bandwagon in the last couple of days to express their support for the principle of free expression. 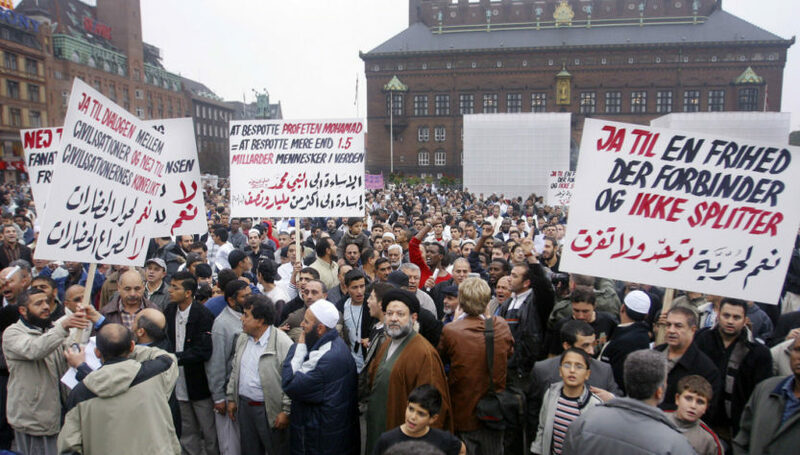 Muslim outrage has spurred protests, kidnapping and death threats, boycotts of Danish products, and diplomatic spats. Danish dairy firm Arla Foods has announced 125 layoffs as a result of the boycott; national leaders have jumped into the foray, and even U.N. Secretary-General Kofi Annan has issued a statement in an attempt to cool the growing crisis. Editors have been sacked in what is seen to be an attack on editorial independence. Media reports are quick to point out that Islamic traditions ban depictions of the Prophet. Thus, the understanding is that the outrage has been caused by the seemingly blatant disregard for this “Islamic taboo” by the publications in question, which is why Reporters Without Borders and other journalists and non-journalists alike are resisting, if not fighting, this wave of rage. I am pretty sure many outraged Muslims will also point to that as the source of their outrage. But I ask: Would Muslims express an equal amount of outrage had the Prophet been shown in a positive light based on his teachings, perhaps instructing a would-be terrorist not to kill innocents? Probably not. Yes, there might have been some disappointment over the depiction of the Prophet(P), but it would not be anywhere near what we are seeing now. Thus, the main issue here is not the depiction of the Prophet(P), but rather, the depiction of the Prophet(P) in an incorrect and dishonest manner. As a journalist, I truly value our freedom of expression and as my colleagues on this message board know, I attempt to stand by that principle whenever possible. We all know that the right to free speech is an integral element of a democratic society. Those of us living in democratic societies enjoy that right on a daily basis. However, no right is absolute. There are always limitations and exceptions. I can express myself by screaming, for as long as I wish, but not to the detriment of my neighbours. Similarly, I can publish whatever I want, as long as I do not tarnish anyone’s reputation by spreading lies or promote hatred against anyone. I can even publicly express damaging, unflattering comments about someone, as long as they are in the public interest and I do not do it with malice. a) He was a terrorist. Anyone who is familiar with the life and the teachings of the Prophet(P) knows that he was not a terrorist. There is no such thing as a terrorist Prophet and if there was, it would mean he and his followers would live to terrorize others, which we know is certainly not the case. Yes, he did lead and fight in battles. But since when did fighting wars become terrorism? If that?s the case, any leader that takes his nation to war should be considered a terrorist. As for the second interpretation, once again, anyone who is familiar with the teachings of the Prophet(P) knows that he did not support terrorism. He forbade the killing of innocents and even ordered his followers not to kill birds and other living creatures unnecessarily. And even though the Makkans had terrorized him and his followers, he did not retort with the same when he conquered Makkah later on, nor did he let any of the followers terrorize anyone either, even as victors. As for the last possible interpretation, once again, if anyone studies the teachings of Allah(T) and the Prophet Mohammad(P) in their entirety, they will know that Islam is not a religion of terrorism. It’s just not true. Yes, there are groups and individuals who attempt to justify acts of terrorism through Islam, but that does not mean that Islam is a religion of terrorism. If it was a religion of terrorism, Muslims throughout history would have been terrorists, which just is not the case. Therefore, we can conclude that if the cartoons are interpreted as a) and b), they are slanderous and libelous, or if they are interpreted as c), they promote hate by branding all followers of Islam as terrorists, and since no one likes terrorists, people will naturally be led to hate Muslims. This issue is not about Muslims hating freedom of expression. Rather, it is about the abuse of the freedom to spread hate and fuel stereotypes. There is no doubt that the cartoons were originally published with malice and spite, to spread stereotypes and provoke a group that has already been victimized as a whole for the actions of a few. But that is not the only reason for the outrage. The level of love and sentimental attachment many Muslims have for and with Mohammad is unparalleled, and may in fact be very difficult to comprehend for non-Muslims. Think of your dead parents or grandparents that you loved dearly. If someone were to slander them publicly and make a mockery of them, how would you feel? Would you not react angrily and defend them? You probably would, except the chances of anyone paying attention may be slim, since you would be alone, or perhaps have the support of a dozen or two people. For Muslims, their beloved prophet has been slandered and mocked. He is not here to defend himself, so his followers have taken on the task, out of their love and devotion to him. What we see now is the result of compounded anger, which isn?t always expressed in the wisest manner, especially when emotions are running high. The issue of incorrect attribution is an important one. If Osama bin Laden was the subject of the cartoons, hardly anyone would complain. Thus, it must be understood that Muslims are not attacking freedom of expression. Rather, they are reacting to hateful, mean-spirited distortions. As for the question about why Muslims are so sensitive about cartoons while they do not speak out against other seemingly important issues, the fact is that these cartoons of the Prophet(P) have struck a common, emotional nerve across the Muslim world, while unfortunately, there is no unanimous agreement on the other issues, with which some Muslims obviously do not have a problem since they take part in or support those actions, such as beheadings, honour killings and suicide bombings. It does not make it right, but that is the reason behind the muted or disjointed response. Some have complained about the boycotts in response to the cartoons. What is wrong with Muslims exercising their freedom of choice? Boycotting is a common tactic for expressing displeasure, even if it doesn’t directly affect those at the root of the displeasure. In fact, in 2004, a group of Americans residing across the border from the Canadian town of Nelson, British Columbia threatened to boycott the town if it went ahead with the construction of a monument to U.S. Vietnam War draft dodgers. The construction of the monument was a form of expression, yet the town was threatened with severe economic repercussions if it had gone ahead with the construction of the monument. It did not. Publishing and protesting are both forms of expression, and they must both be exercised within reasonable limits. Muslims deserve an apology. And they seriously need to learn how to contain their emotions and express their displeasure using non-violent means. But as long as the incorrect analysis of the issue as a “freedom of expression vs. Islamic stigma” battle remains, I’m afraid the vicious cycle of publications and protests, and more protests and more publications, will continue. Taken from sunniforum.com, published with permission. Islam is the only religion which opened the gates of civilisation to the dark ages in Europe. Renaissance movement started after the Crusaders came into contact with Muslims (followers of Islam) and European were shocked to note that their ‘sin’ of bathing (in middle and dark ages it was a sin according to church to take a bath) was a regular feature of Muslims’ daily life and that they didn’t therefore suffer from the Plague’s disaster with the same magnitude. Spanish rule of Muslims ( 800 – 1492 AD) introduced Medicine, Algebra, Maths, Philosophy, Geography, Oceanography, Astronomy, Surgery, Chemistry to the scholars of Italy, Germay, France and Britian who flocked to Adulasia (Arabic for Spain) to learn and graduate. Cannon (Qanu fil tibb) by Avicenna was the standard text book of medicine in the medical schools of Europe for five centuries. The hatred has been historical as the defeat in crusades have imprinted an impression of barbarism on the minds of Europe and their prejudice grew with every defeat. Over the time Europe emerged as enlghtened super power and realized their benefactor’s place in history. Things went well till President Bush was has a reveleation that Isalm is evil. Modern media, under the strong leadership of Jews (no its not a myth) cashed that opportunity and a modern day hatred started. Isn’t it irnonic that even Laden has not been convicted in a court of law and the world opinion and Western media has successfully tried him and Taliban and Iraqis and Palestenians, and convicted them on their own. Reports not the evidences have become the modus operandii for these modern courts of justice and Bush administration labels Lebanon as terrorist and creates hatred among the Western hemisphere against Islam while conveniently omitting the naked aggression by Israelis against Lebanon and 33 days of bombing becomes justified. Daily deaths of more than 50 Iraqi and Afghani/ Palestenian children and women donot find their place in the media hence they are not considered human enough while a single episode of a murder by a Muslim finds place in the press and electronic media as Islamic Jihad. Ironically Adolf Hitler is never termed as Christian monster or killer. So its not that people hate on their own, they are being made to hate Islam. Truth has lost its meaning and we are bombing our own suspicions without even bothering to find proof and show it to the world.